Spain is not only a place with beautiful architecture and culture, but it is also a country with great gastronomy. The best way to get to now the Spanish history and cuisine is to visit the Gothic center (The Old City) where you can try some of the best Catalan food in unique and iconic restaurants. Oçaña is a stylish and creative restaurant named after famous street entertainer José Pérez Ocaña who was, many years ago, performing there in women’s clothing. That is why, on weekends, transvestite waters serve the drinks creating a very unique and interesting atmosphere. This place is a restaurant, café, and cocktail bar so you can come here whenever you want to have a snack or a drink and enjoy in the magical view to Placa Reial. If you want to drink a cocktail we recommend Mojito and Bloody Mary Infusion. Els Quatre Gats is the most famous restaurant in the Gothic Quarter. 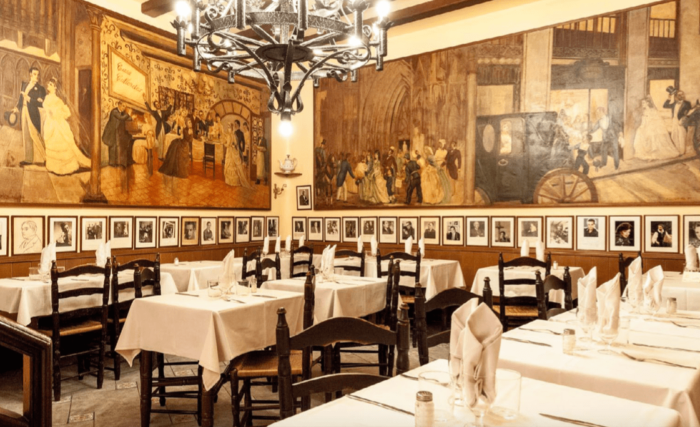 Their history is pretty amazing so if you come here maybe you will sit on the same chair where Antoni Gaudí or Pablo Picasso were sitting during their time. In 1899, when Picasso was 17 years old, he held his first exhibition in the main room of this restaurant. He also designed the large poster in the restaurant that is now used as the cover of the house menu. If this atmosphere is not enough for you to experience Catalan history and culture than you must order authentic dishes such as Selection of Catalan artisan cheeses, Catalan crystal bread with hanging tomato and arbequina olive oil, or homemade crema Catalana with red berries. 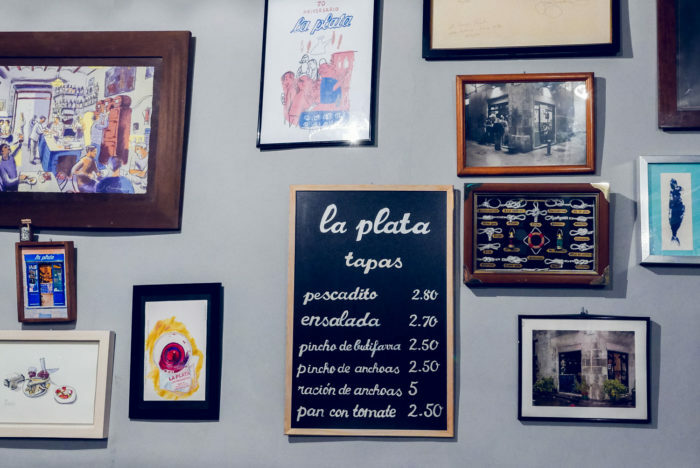 Bar La Plata is one of the most authentic tapas restaurants in Spain. 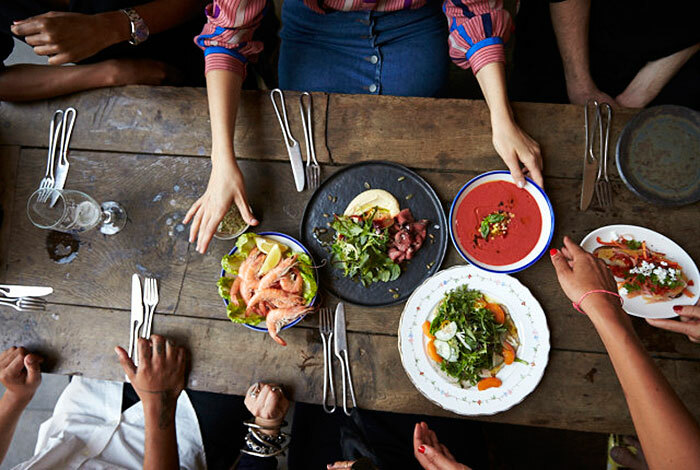 Their menu is the same from 1945 and it consists of four Catalan dishes: fried fish, tomatoes with anchovies on bread, a Catalan sausage butifarra and a fresh salad with tomatoes, onions, and olives. The restaurant is very casual and it has only a few tables. Tapas are authentic and old school and they cost under 3 € each. We recommend you to combine them with a glass of local red wine. This restaurant dates back to 1786 and it is the second oldest in all of Spain. They are placed in the middle of Barcelona’s meeting point, close to Las Ramblas and are serving original food from Catalan. An average menu costs around €17 so the lunch will not be the cheapest one but, considering the fact that this is a famous place with some great history and authentic atmosphere, prices are actually pretty low. If you want to find a quality food that is on your budget check the list of Cheap eats in Barcelona. Take a look at the Habitat Apartments website and find yourself a perfect apartment in the Gothic quarter!